It begins with an ordinary, yet unfortunate, circumstance. 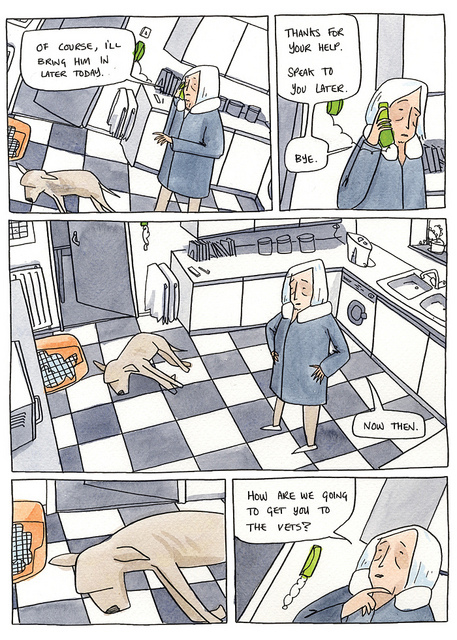 After agreeing to feed her neighbour’s cat and dog while they’re on a weekend break, Helen, on a visit to feed the pets, finds the dog dead. Nothing untoward; Cruncher had had, by all accounts, a long and good life, but still upsetting to find when you’re house-sitting someone’s pets, and sad for the owners to not be able to say a proper goodbye. She gives her holidaying neighbours a call to inform them of Cruncher’s demise and it’s agreed that it’s best for Helen to take care of things while they’re away and so another quick call to the vets establishes that they’ll be able to make the necessary arrangements in lieu of burial. It’s only once she puts the phone down Helen realises she has no means of transporting Cruncher’s body to the vets. Stepping outside, she tries to ask Richard, her other (vile) neighbour to give her a lift in his car, but he’s not having any of it; shoutily reminding her about a favour she agreed to for him and ignoring anything else she says. And so Helen, desperate to make the given time at the vets, decides to bundle poor dead Cruncher into a trolley suitcase and take the bus there instead. Thus begins a journey of escalating oddness, decisions that seemed perfectly viable at the time and the dreaded ‘c’ word: consequences. Of course, once you decide to put your neighbour’s dead dog in a suitcase and embark on public transport, chances are a ne’er-d-well will want to chat to you about where you’re going and what’s in the travel case. And of course, you don’t want to seem like a weirdo who kills animals and keeps them in luggage, so you make up an ill thought out cover story about your nephew’s computer. Which is all a young ne’er do well wants to hear from an older lady on the bus. Reader, he steals it. And that’s all I’m going to tell you about the plot. 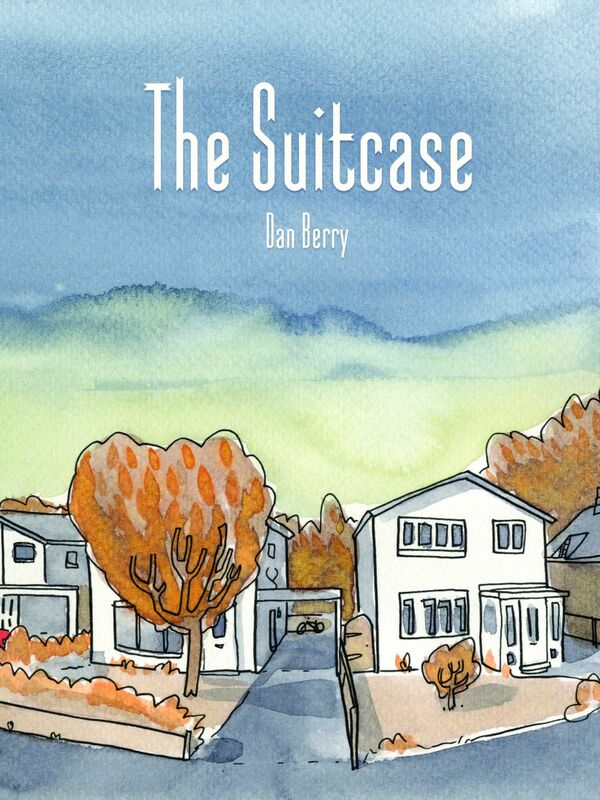 Berry divides The Suitcase into 3 chapters: each following one of the 3 neighbours, the interlocking tales following on from one another chronologically and making up the larger narrative. Another pet death (this time suspected murder), a hilarious, cringe-worthy Top Gear audition and an accident sees a descent into a hilarious farce. It’s a very British book in many (great) ways: the escalation of events and the catalogue of mistakes and manners is reminiscent of the best sitcoms and sketch shows. I’m a big fan of Berry’s art (there need to be more watercolour comics in the world); he has a style that’s incredibly lovely and accomplished, the kind that’s incredibly easy on the eyes and not obtrusive to the reading experience, instead furthering and enhancing it quietly. He has a fine, controlled line that results in just the right degree of expressiveness without descending into messy territory, rather like a reined in Quentin Blake. My only wish would be that the art conveyed movement better as at times it can feel a bit flat. Berry’s paints and colours are beautiful too- there’s an autumnal feel to a lot of his work (Cat Island, After We Shot the Grizzly), lots of browns, oranges and purples, yet I always get the feeling his palette is very pastel-ly- even when that’s not the case, perhaps due to the light washes. His colouring choices are harmonious and cohesive; he’s started using brighter colours increasingly, seen again here with the recurrance of red, acting as a signifier for ensuing danger, action, ridiculousness. 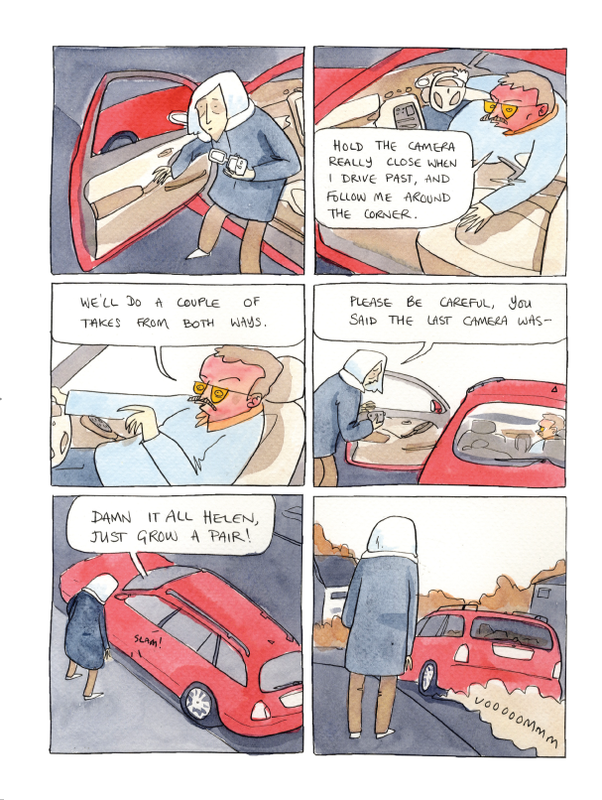 I particularly like the way he introduces it in different ways; as a mood wash in the bus scenes, as a character with the brash overbearing car and, of course, as the colour of the eponymous suitcase itself . That pop of colour brings with it an element of anticipation as you being to subliminally associate it with the occurrence of events. 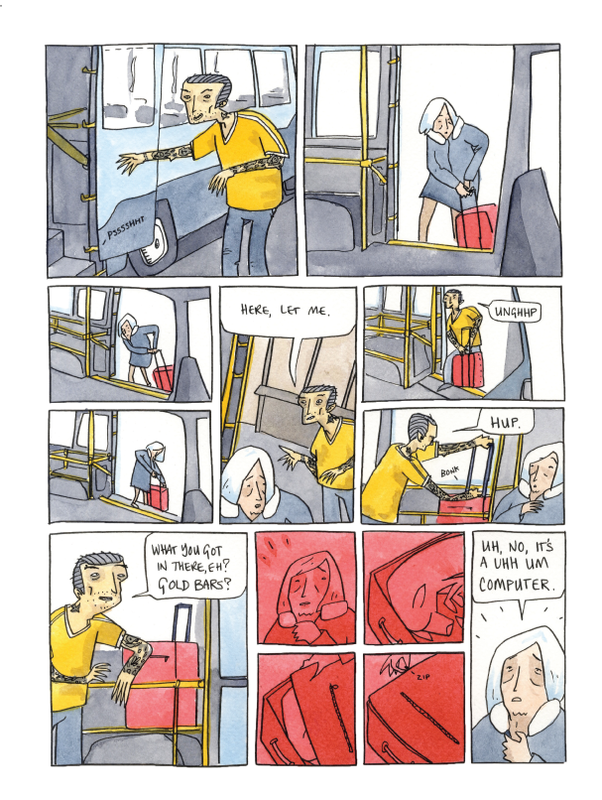 The Suitcase is a lovely, witty antidote to a lot of comics work out there- work that forgoes originality and story for experimentation or perceived depth. I’d been hankering after a longer book from Berry for a while and after 50 pages of this, I was still after more, that’s how good the man is. Publishers Blank Slate are currently charging only £4 (which is about $6) for shipping to anywhere in the world which is all the incentive you need to grab a copy of this: it’s a fab, hugely enjoyable comic and you’ll be all the better for reading it.